I am now 37 +2 weeks pregnant and I only have at most two weeks of pregnancy left! Week 36 was a busy week so let me tell you what my pregnancy was like at 36 weeks. If you saw my pregnancy post last week 35 update you will have seen that I had a hospital appointment to see my consultant and for a growth scan when I was exactly 36 weeks pregnant. All was well on the scan and baby has had a bit of a growth spurt and is now no longer small, they estimated his weight to be around 6lbs and told me to expect a 7 and a half pound baby at birth. If that is true then he will be my smallest baby as the girls were 8lb3 and 8lb2, I am still expecting him to be a big baby for some reason even though my bump is not that big. I then had an appointment with the doctors and it was decided that the best thing for the baby is to be born at 39 weeks due to the medication I am taking for my blood pressure and the risk that it may rise later in pregnancy or reduce the placenta function in some way. So I have been booked in for an induction when I will be exactly 39 weeks pregnant. I am feeling a little nervous about this for some reason. I have had an induction in my first pregnancy and i was lucky it was a quick four and a half hour normal labour so I am keeping my fingers crossed that the same thing happens this time. As soon as I left the hospital and knew the baby would be arriving soon I went out and bought all of my hospital bag things and some more cute baby outfits. I have also ordered him a new mosses basket from kiddicare and a nodpod blanket and a new colour pack for the pram (he is having Sophia's oyster pram as we only used the pram bit for a few months). I just have a few more things to buy for him like tins of milk and a nice changing bag and then I will have everything ready for him. I just need the baby to hold on a bit longer so that I can pack my hospital bag, wash all his tiny clothes and have a good clear out and clean of the house then I might feel a bit more ready and organised for his arrival. I am still very lucky that I have had no sickness, cravings, heartburn or any other unpleasant pregnancy symptoms. But I am starting to struggle with pregnancy now, I am not sleeping very well at all, I just can not get comfy at all my back and hips and legs ache when I am in bed. I have started getting really bad headaches most days and just don't feel right. I am also still really struggling with the heat, not surprising really as it is now August. 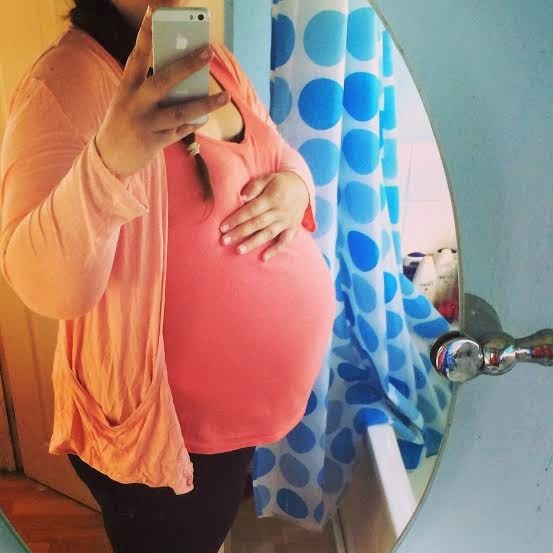 I never realised how awful it is to be heavily pregnant during the summer, I thought it would be lovely to be pregnant in summer and had visions of lots of lovely days out wearing nice summer clothes but that is so not true at all. I get hot and sweaty and uncomfortable and I am living in leggings and maternity tops, no nice summer outfits for me. I am also getting so tired and I just want to stay at home a lot, I am getting too uncomfortable and tired going out. I am hoping that I get a burst of energy to do nesting soon, as my house is looking a bit neglected. I am also feeling a bit guilty that I have not been doing much with the girls in the holidays, I am normally out all the time with them when Chloe is off school but I have only managed to take them out a few times. Baby is still really active and I am getting lots of wriggles and kicks and some big movements still which hurt at times. I can tell which way he is lying now from his kicks, he seems to keep moving from side to side. That's about all that's been happening this week bump wise. the weeks really are flying by and I can not believe that in just two weeks time I will have had my baby boy and will be a mum of three.